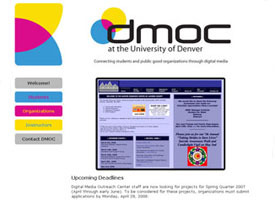 These are some of the websites that I have designed and coded, both on my own and with other students. Click on an image to view the entire website. 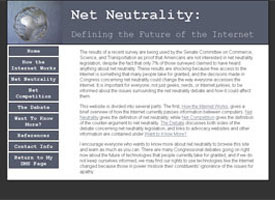 The first website that I designed while studying for my Masters degree was an informational website on network neutrality. I chose the topic because of its importance to the study and practice of digital media. The website was designed in October 2006, so the information may be out of date and certain video clips may no longer be functional, but the design is completely intact. While taking a class called Designing Social Awareness, I worked with two other students to design a website and print campaign for a non-profit organization or cause of our choosing. We chose to create a campaign that promoted multi-lingualism, and designed this website for the campaign. We collaborated on the design and the content, and I was responsible for writing the code that created the website after all the designs and content had been created and written by my teammates.